This broad-spectrum nutrient-rich freshwater chlorella is of the highest organic grade. Chlorella is a microscopic freshwater plant with an ability to capture nature’s energy. It is one of the most nutritionally dense foods in the world, filled with protein and vitamins. 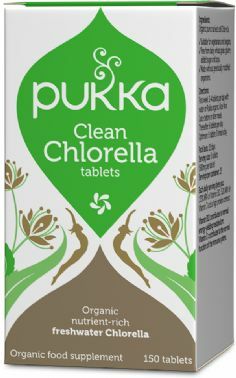 Pukka use a special process where the tough cell walls are cracked, releasing Chlorella’s true nutritional value. This broad-spectrum chlorella is of the highest organic grade, sustainably cultivated and carefully selected to bring you the full potential of nature’s goodness. First week: 2-4 tablets per day with water or Pukka organic Aloe Vera Juice before or after meals. Thereafter: 6 tablets per day. Optimum: 6 tablets 3 times a day.